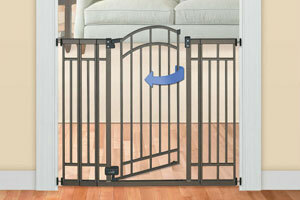 The Evenflo Embrace Wood and Metal Gate is one of the higher-end Evenflo baby gate models. Evenflo has been around since the 1920s and its name has since become synonymous with baby products. 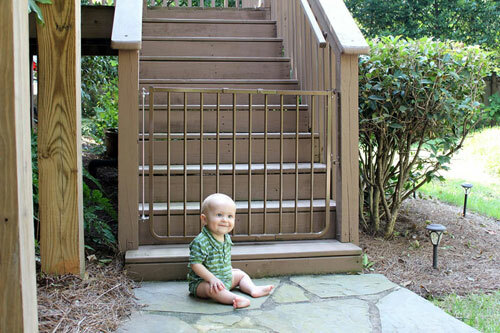 While they’re best known for their baby bottles and carseats, there are numerous Evenflo baby gate models as well. 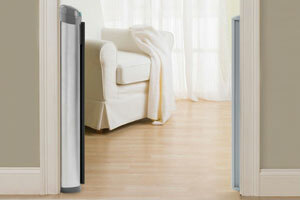 In this article we’ll provide an overview of the brand and the types of baby gates they manufacture. Compared to other brands, Evenflo baby gates tend to be in the low end of the price range with the majority of their gates priced around $30. 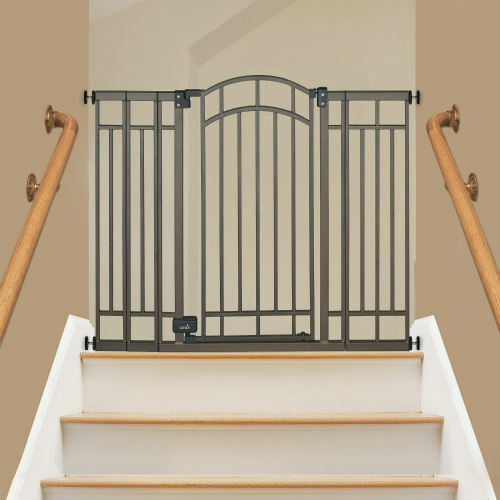 Evenflo produces a variety of different style gates, including pressure mounted gates, hardware mounted gates, swing gates, walk-though gates, and mesh gates. In the chart below you’ll find comparisons of popular Evenflo baby gates. We hope the comparisons will be useful in getting a sense of the options. Hopefully the chart above has provided a useful overview of the different Evenflo baby gate styles. You can see that Evenflo manufactures a variety of models, including pressure mounted gates, swing gates, and hardware mounted gates. Below we’ll go into more detail on a few of these different models so you can get a better idea of which kind is most fitting for your home. 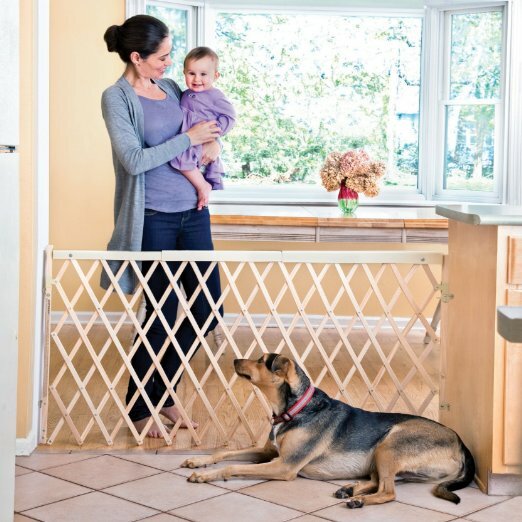 The Evenflo Soft And Wide Gate is a pressure mounted mesh baby gate that has earned a 4.4 out of 5 star rating. 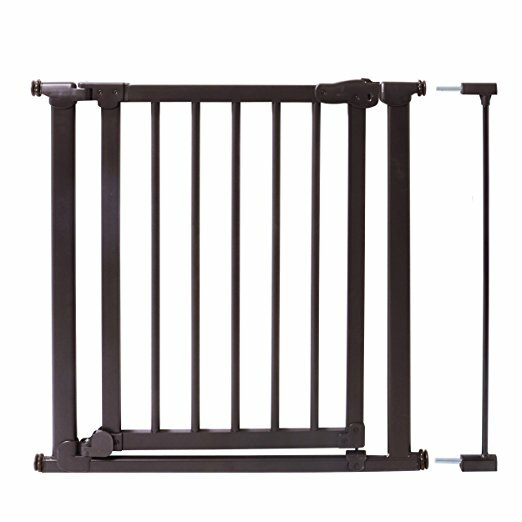 Because this model is pressure mounted, no tools are required to mount the gate and it is mounted simply by adjusting its spindles. Its width can be adjusted to fit spaces between 38 and 60 inches wide. 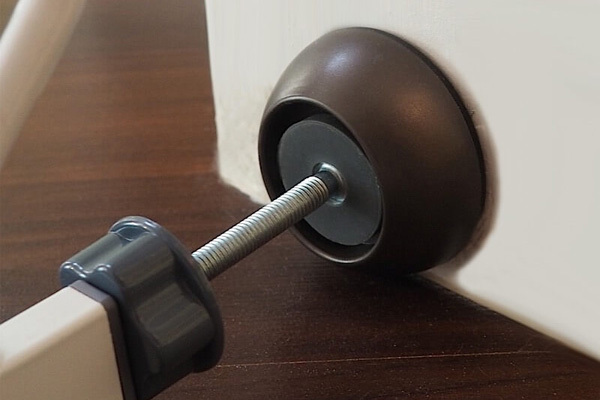 The spindles’ mounting feet are coated in rubber to help prevent damage to your walls from the applied pressure. 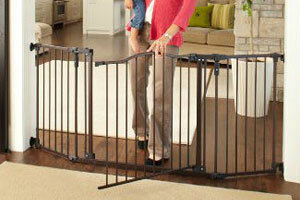 The gate is 27 inches tall, which is a mid-range baby gate height. At a weight just under 7 pounds, it is easy to move when needed. In fact, this model is easy to completely take down and put away at your leisure. Since this gate is made of mesh it provides a soft barrier so little ones aren’t at risk of getting bruised by bumping into it. The mesh is high quality and it is machine washable. The biggest drawback of this gate is there is no way to pass through it, so adults have to step over the 27-inch-tall barrier to get from one side to the other once it is installed. The Evenflo Expansion Swing Wide Gate is a hardware mounted model constructed of wood and plastic. 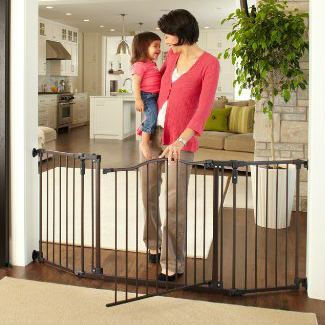 The gate conveniently contracts and expands to span spaces from 24 inches wide to 60 inches wide. 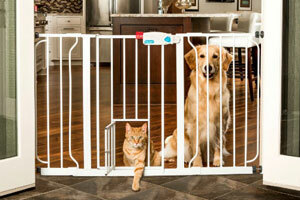 At a max width of 60 inches, this gate is considered an extra wide model. The top of the gate is covered by a telescopic plastic safety rail that adapts as to the gate’s width. 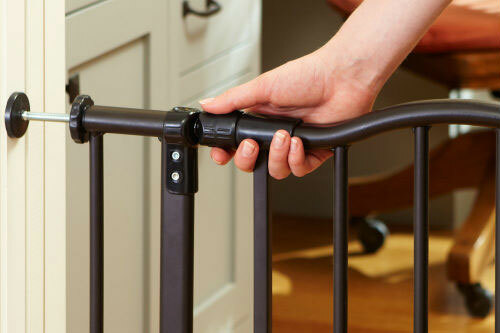 This ensures that there are no rough edges on the gate’s top for babies to grab. This gate can also be swung open by adult for easy pass-through access. The gate can swing either inwards or outwards as needed. The gate stands at 32 inches tall. The biggest complaint about this gate is that clever toddlers are able to figure out how to open it. If your child is too small to reach the top, this isn’t something to worry about. 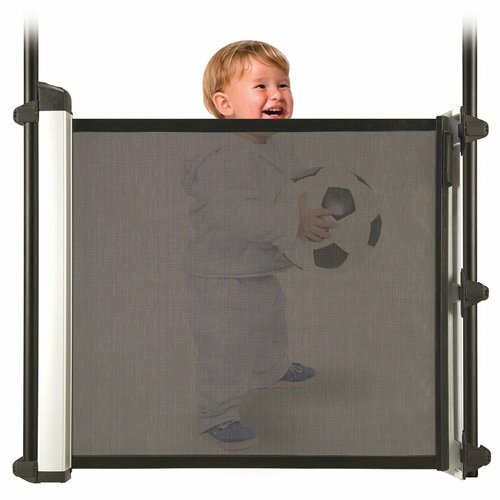 However, if your child can reach the top of the gate and is inquisitive, this gate may not be a good fit for your home. The Evenflo Embrace Wood and Metal Gate is a more heavy duty model compared to the others in our chart. 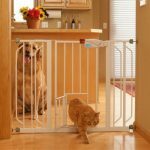 Because it’s more durable and made of stronger material, this gate is roughly double the cost of other Evenflo baby gate models. 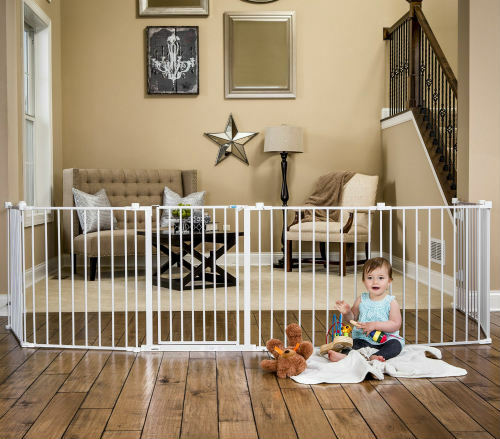 However, since Evenflo baby gates tend to be on the inexpensive side of the spectrum, this model is still in the middle of baby gate prices in general. This is a pressure mounted model requiring no hardware to install. 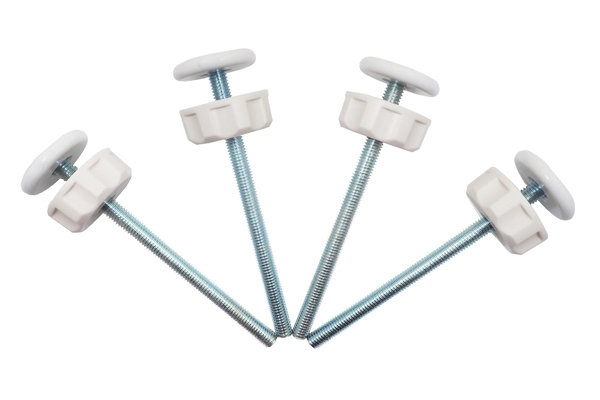 It’s made of powder-coated metal and wood for added durability. 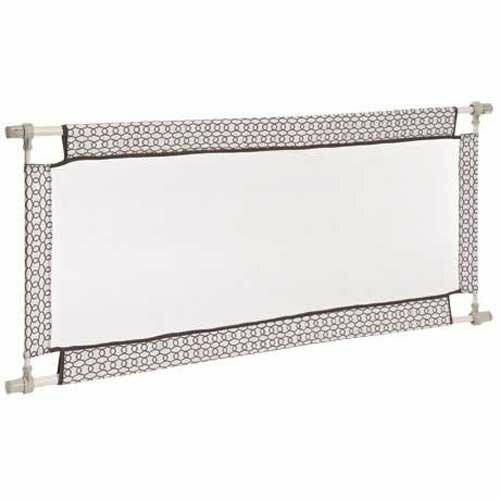 The standard version of this gate is made to fit only standard openings between 31 inches and 32.9 inches wide, which doesn’t offer much flexibility. If you need a few extra inches, this model can be purchased with an extension that can cover up to 36.25 inches. It is 30 inches tall. The Evenflo Embrace Wood and Metal Gate also includes easy pass through for adults via a door panel in the center of the gate. 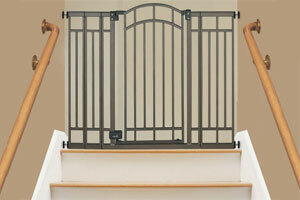 The most common complaint for this gate is that it is not as durable as would be ideal. However, most people who purchased the gate feel that its quality is good for the price.